ST. MARYS…STATE COLLEGE…SUNBURY AND WILLIAMSPORT. 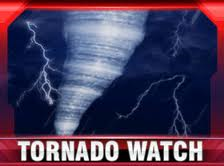 A tornado watch (code: WT; sometimes referred to as a “red box” by meteorologists and storm chasers) is issued when weather conditions are favorable for the development of severe thunderstorms that are capable of producing tornadoes. A tornado watch therefore implies that it is also a severe thunderstorm watch. A tornado watch must not be confused with a tornado warning. In most cases, the potential exists for large hail and/or damaging winds in addition to tornadoes. A watch does not mean that the severe weather is actually occurring, only that atmospheric conditions have created a significant risk for it. If severe weather actually does occur, a tornado warning or severe thunderstorm warning would then be issued. Note that a watch is not required for a warning to be issued; tornado warnings are occasionally issued when a tornado watch is not active (i.e. when a severe thunderstorm watch is active, or when no watches are in effect), if a severe thunderstorm develops and has a confirmed tornado or strong rotation.